The unfolding of interactive competition selects not only for mass and allometries; it selects more generally for any trait that will enhance the interactive quality of the reproducing unit. But these traits require energy, and their evolution is dependent on an interactive competition that occurs frequently enough to balance their energetic requirements. This frequency is given by the competitive interaction fix-points of the selection attractors on mass; with the selection of major life history transitions between the attractors. To predict life history evolution by interactive competition we need to determine the selected frequency of interference competition and the associated resource bias in the population. This bias is given by the competitive interaction fix-points for the selection attractors on mass. The most straightforward fix-point is maybe the attractor for the multicellular animal with a stable net energy and mass. It defines a body mass invariant interference that generates a resource bias of unity [ ψι** = 1 ]. The increased net energy of the larger individuals is then out-balancing the quality-quantity trade-off, making relative fitness independent of mass. i) Initially, for replicating molecules and the smallest self-replicating cells with an internal metabolism, there is an absence of a resource bias [ ψι** = 0 ]. ii) For the somewhat larger interacting cell, the resource bias is increasing from zero to one with an evolutionary increase in mass [ 0 < ψι** < 1 ]. iii) For the multicellular animal with an upward constrained net energy there is an equilibrium mass with a selected resource bias of unity [ ψι** = 1 ]. iv) For unconstrained selection in multicellular animals, there is an exponential increase in net energy and mass at an evolutionary steady-state with a somewhat higher level of interference [ ψι** = (4d - 1) / (2d - 1) ]. v) And with an upward constrained mass, the level of interference may increase towards infinity [ ψι** → ∞ ]. It is the interference of the competitive interaction fix-points that constrain the reproductive potential of multicellular animals. The average reproductive potential will evolve to be exactly so high that the left-over from the toll of mortality and density regulation results in an equilibrium abundance that generates the level of interactive competition that is selected by the attractor of the competitive interaction fix-point. This makes the reproductive potential inversely related to the probability to survive to reproduce. The energetics of the organism is optimised by natural selection to match the reproductive potential of the competitive interaction fix-point. This selects for a trade-off where an increase in the rate of reproduction generates increased mortality in the offspring and/or the parent, with the physiological optimum being Lack’s clutch size. Senescence is a deterioration of tissue with age, and it has traditionally been seen as a contingent character that evolves from the intrinsic constraints of a soma that is not passed on in either sexual or asexual reproduction. When a soma is present, there is a decline in the force of selection with age, and this selects for early reproduction and survival at the cost of an energetically costly maintenance that will prevent the soma from deteriorating. Yet the decline in the force of selection with age is present also in asomatic organisms, and it is therefore more likely that the soma is the phenotypic trait thought which senescence is expressed. In the multicellular animal where the exponent of the mass bias in net energy is at least one, it follows that a deteriorating soma may evolve as a competitive trait where the energy that can be used for tissue maintenance is allocated into competitive interactions instead. This selection is avoided in self-replicating cells with a mass bias exponent that is smaller than one. Large interacting units can dominate units with fewer individuals, but they suffer from the cost of resource sharing. This makes the evolutionary equilibrium for the size of the interacting unit proportional to the level of interference competition in the population. For the self-replicating cell with a mass bias exponent below unity the optimal interactor is the individual itself. The optimal units for multicellular organisms contain two individuals for the competitive interaction fix-point of a mass in evolutionary equilibrium, three to four individuals for the fix-point of the evolutionary steady state, and a plenitude of individuals for the fix-point with an upward constrained mass. Interacting units with more than one individual can enhance their competitive ability by evolving interacting individuals that specialise in interactive competition at the cost of reproduction. Such units will suffer from a reduced reproductive potential that is known as the two-fold cost of the male. The optimal number of interacting individuals is determined by the level of intra-specific interference competition, and for single celled replicators with low interference competition the optimal reproducer is the individual itself. The optimal reproducing unit contains one reproducing and one interacting individual at the competitive interaction fix-point of a mass in evolutionary equilibrium, one reproducing and two to three interacting individuals at the fix-point of the evolutionary steady state, and one reproducing and a plenitude of interacting individuals at the fix-point with an upward constrained body mass. Reproducing (female) individuals can use sexual reproduction to attract interacting (male) individuals. The females that allocate the largest fraction of the male genome to the offspring may attract the competitively superior males. While this increases the interactive quality of the female’s reproducing unit, it is costly owing to the sharing of the genome in the offspring; a cost known as the two-fold cost of meiosis. The selection optimum to the degree of sharing is determined by the level of interference competition, with the optimum at the competitive interaction fix-point of a mass in evolutionary equilibrium being equal sharing between a male and a female. This causes sexual reproduction to evolve in multicellular animals, while asexual reproduction is found to be the optimum in single celled organisms. 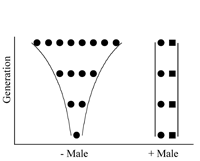 Where the optimal reproducing unit is the male-female pair in multicellular animals with equilibrium masses, the unit contains one or two extra interacting individuals in species with exponentially increasing masses at evolutionary steady states, and an almost unlimited number of interactors in species with upward constrained body masses. But should these extra interactors be offspring workers or sexually reproducing males? With the interactive quality of the male being transferred by sexual reproduction to potential offspring workers, there is a diminishing return in the interactive quality that can be gained by increasing the number of males that participate in sexual reproduction. The result is selection for co-operative families and eusocial colonies, where the extra interactors are sexually produced offspring workers that evolve at the cost of unknown forms of sexual reproduction with several males per female. With sexual reproduction between a female and a male being selected as a trait that optimises the frequency dependent trade-off between reproduction and competitive interaction, there is selection for a heritable code that ensures an equal parental share of the genome that is replicated to the offspring. While different codes can be imagined, the diploid genome, where the female and the male supplies a copy of all the genes in the offspring, is maybe the best solution to avoid selection conflicts between the genes of the parents. But equal sharing is strictly fair only when the energetic fitness of the male and the female are equally important for the successful reproduction of the unit. This is the case when the interactive behaviour of the male is just as essential as the reproduction of the female. It is also the case in cooperating and eusocial units where the male behaviour is essential and the two sexual individuals form a lasting bond, as in the eusocial and diploid termites. It is, however, not the case in hymenoptera-like eusocial species, where the energetics of the male is irrelevant as he is needed only for mating; with the energetic cost of the male selecting for a male-haploid female-diploid genome.